A soldier's soldier when on the field of battle. He has a cold and calculating mind set with a main goal in battle is to complete the mission objective at all costs. Even when this means that his own team may be put in harm's way. He has absolutely no problems with using interrogation techniques on prisoners for information if it means helping Starfleet and his Captain. Gralek has been known to say, “What works, works.” However it should be said that he does take a certain level of enjoyment or pleasure when he has to get his hands dirty. As a realist he has a very blunt way with dealing with people outside of battle and has a slight insidious streak when it comes to messing with others. Gralek is a blue skin Andorian with white hair. 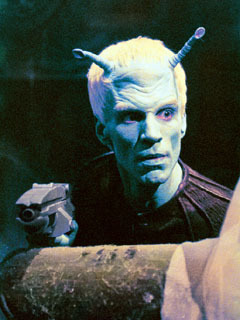 Gralek being Andorian has a higher metabolic rate than Humans, which could theoretically permit a Human opponent to best him in hand-to-hand combat by simply exhausting him, But he is highly trained in multiple fighting techniques. He demonstrates resistance to a wide range of environmental conditions. In a climate where the temperature was near the boiling point of water, or hypothermic temperatures. He wears a red starfleet uniform and keeps a phaser pistol on his right hip, if he could he would carry a phaser rifle instead so he can protect his captain and fellow officer with as much force as is ever needed. **Biography:** Born in 2365, Gralek was born on Andoria, a rather cold planet but A place he loves. His father was rather outspoken and tough but fair, while his mother was very caring and supportive of them both. Being in a small family as the only child, his parents spent much of their time caring for and teaching him in Andorian behaviors and ideals until he was ready for schooling and education in the capital city. With his home town being a good distance away from the capital, it also had wide open spaces and memorable landmarks, perfect for shooting ranges and navigation training. His father took advantage of this to train him with weapons safety, accuracy, marksmanship, and navigation. He started off easy for his first few times, but then gradually became more controlling and demanding during training, frequently forcing him to start over for narrowly missing the target or falling close to the target. Despite all this, Gralek quickly became a natural with the Phaser rifle, training and improving to become a natural with the weapon. When Gralek turned 15, he immediately signed up to go straight into the Royal guard military service, hoping to use his skills for something good for the Andorian hierarchy and military seemed like the best option at the time. Training was undoubtedly intense, as with any kind of military training, with him initially receiving high marks for marksmanship and weapons but low marks for communication and squad cohesion. He was a natural in weapons training, but it took numerous training sessions for him to learn to properly communicate and coordinate with his team. Gralek became a Unit leader with his natural ability in marksmanship and apparently growing talent in stealth operations. At the start, superiors gave him simulated reconnaissance missions to test him on intelligence gathering without detection and while there was the occasional slip-up and restart, he passed them all. He was then assigned to live missions with squads in which he would serve as a Squad leader he would take down enemies as quietly as possible without drawing too much attention to the rest of his squad. With a talent for phaser rifles, he also fit different squads as a sniper, providing covering fire and taking out enemies from the back lines as the front line of his squad carefully advanced. In 2380, Gralek had been put in his first unit and were sent to the Gamma Quadrant when the Dominion attacked his unit who were unprepared for their tactics. Gralek was supposed to keep out of sight and keep safe as the leader of his squad but he followed his unit to the front line without them noticing him. To his horror he was watched as a group of Jem’hadar executed his Squad. He would then run to a bunker where a group of civilians were hiding. This would be the beginning of his hatred for the Jem’hadar . Grelek would feel dishonored by the loss of his unit and leave the Royal Guard to join Starfleet and protect more than just his world this time. Once at the academy he would be run through rigorous training. Target practice, medical practice and tracking training. After two years he was considered the best recruit that had ever gone through the academy. He would graduate with high honors and be certified as a Tactical Officer..
What he thought was tough training at the academy was nothing compared to what he had to go through now. Almost no sleep and constantly under high stress made Gralek tough to the core as he would now join the USS Standing Bear.